A few years back, my sister gave me some nice silk pajama pants for Christmas. After a lot of wear and tear, they developed a pretty big hole in a place too risque even for lounging around the house, so I retired them. It seemed a shame to throw away such nice fabric, so of course I had to think of a way to upcycle them! 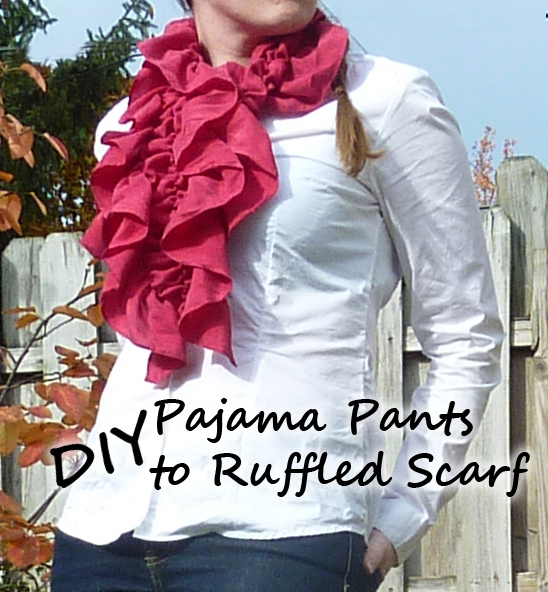 Inspired by this blog post I found on Pinterest, I decided to try and turn them into a ruffled scarf. One pair of pants will make two scarves. Here’s how I did it. First, I trimmed off all the hems and waistband, which left four vaguely leg-shaped panels. I stacked the four panels and trimmed the wider parts until I was left with congruent rectangles. A rotary blade makes this pretty easy. The angle of the photo makes them look wider at one end, but try to make them roughly the same. Sew two of the panels together at the short sides into one long panel. The seams will not be very visible in your finished scarf. Don’t worry, when you add the ruffles, it’ll shrink considerably! Mine was about half the length after adding the ruffles. If you’d like a longer scarf, consider using three of the panels. At first I tried using all four panels, but it was too long – four are shown sewn together in this photo. Unfortunately I don’t have a photo of this, but I finished the edges of the scarf with a rolled hem. You can do this on your sewing machine with a rolled hem presser foot, and it looks really nice on a lightweight fabric like this. If you need some instruction, here’s a nice video that should help. If you can’t do a rolled hem, a regular one should be fine! The final step is to sew the ruffles. 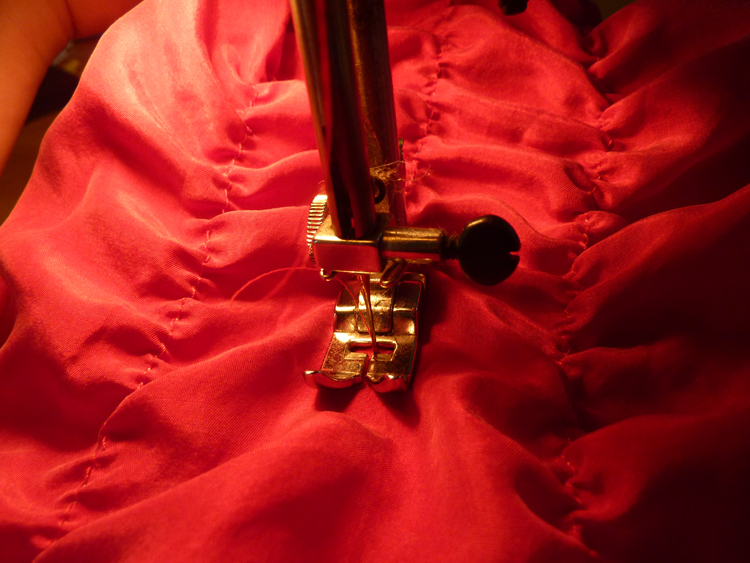 The easiest way to do this is by using elastic thread on your bobbin (hand-wound, not too tight, not too loose! ), with thread that matches your scarf on the top. 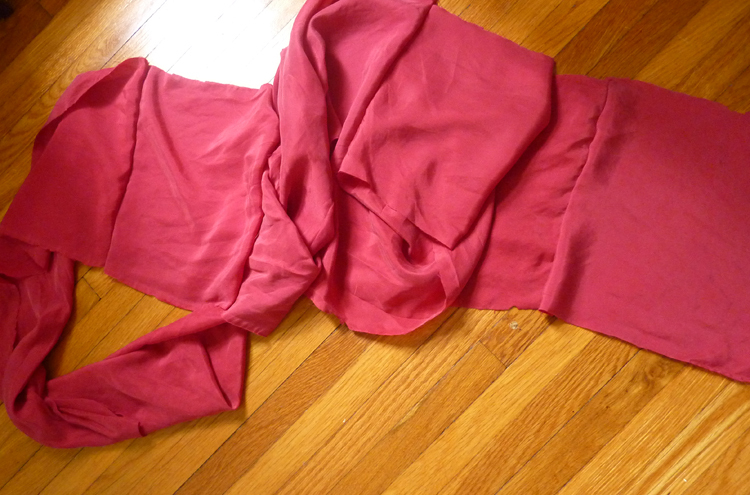 Sew a line straight down your scarf, right side up, about one-third of the width of the scarf away from the edge. Repeat on the other side. Repeat in between your two lines, and you’re done! With three lines of elastic thread, my scarf is about three feet long. The more lines you sew, the shorter it will get. This lightweight scarf makes a great accessory for fall or spring.